Regular readers will know that I don’t often do accessory reviews, having only done so on relatively few occasions. That being said, the folks at ScrewPop sent me a sample of their new tool to try out and I thought the experience I’ve had warranted mention. 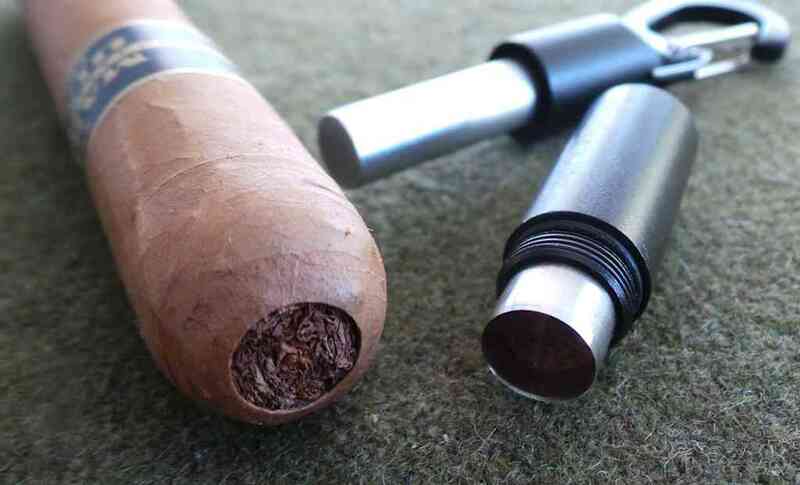 If you’re not familiar, the ScrewPop Cigar Punch is a multi-functional tool serves both as cigar punch and bottle opener. It will clip to your keychain or anything else you can fit the end clip on. I actually used and carried the original version attached to my keychain or travel humidor for a while, but…frankly…the blade was a bit overmatched by my typical usage. It produced a narrower cut than I normally opt for when electing to use a cigar punch, and the honed angle on the blade was too steep. A steep slope on a cutting blade will, of course, eventually lead to a poor cut and mangled head. 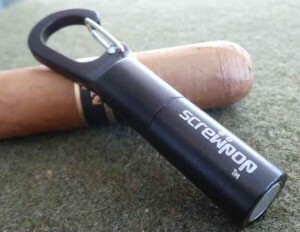 Back in May, I posted a notice on The Cigarmy when the company announced that ScrewPop 2.0 was in the works. But when a package arrived from the company a couple weeks ago, I didnt’ really know what to expect. I’m happy to report that I have been using the device almost exclusively since I got it and have to admit it’s remarkably better built than the original. Complete redesign of the mechanism. Originally, the blade was on the body of the ScrewPop, and a cap was threaded to cover it. This left an internal chamber that held the cut plugs from cigars until you picked them out. Now, in what I believe a much better design, the cutter screws off the body – and the body goes entirely through the cutting apparatus so that plugs are discarded every time you put it back together. This is a sweeping improvement. The blade material is thinner and sharpened to a better edge. It appears to even be ported on the inside, allowing for a smoother cut when twisted. On top of the design change, this is another welcome change. What good would a gadget be if it couldn’t make a clean cut? The bore seems to be bigger on the 2.0. I’m not sure this is actually the case; this could stem from the improved angle of sharpening on the blade. In any event, the new version produces a much cleaner, freer opening than I remember. The production quality remains solid. Version 2.0 is still constructed entirely of aluminum and stainless steel, but simply “feels” better made. The threaded connection and properly sized O-ring cushion create a better fit when reassembling the punch. As always, the materials make it rust resistant and durable. I don’t see any real weakness in handling and use. I’d be comfortable attaching it to travel humidor, keyring, zipper pulls, or wherever else I might need a cutter or opener. As I mentioned, I’ve been using the new one. A lot. Overall, I couldn’t be more pleased. The only change that could be construed as a negative is that the price has gone up from about $8 to almost $15 – however, I believe it’s still a worthwhile investment. 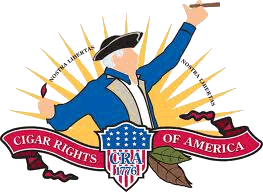 I’ve paid more for cigar punches on at least two different occasions where I was disappointed in short order. At the $14.95 mark, I would be comfortable replacing mine should I need to in the future. Of course I’m the guy that would rather just pay more and get a useful product rather than save a buck and grumble about it for its entire life….